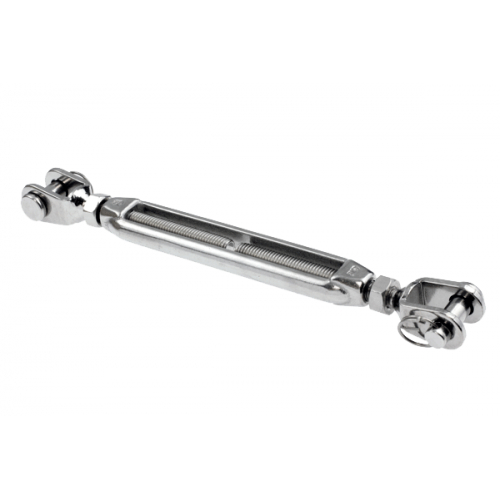 Miami Stainless AISI 316 marine grade stainless steel Turnbuckles Jaw/Jaw, are specifically suited for adjusting the tension and length of stainless steel wire rope, balustrade systems and other tensioning methods. Miami Stainless Turnbuckles consists of two (2) threaded AISI 316 grade stainless steel forged Jaw, forged Eye or welded Hook Terminals screwed into each end of a forged stainless steel frame. One end of the Turnbuckle is threaded left-hand and the other threaded right-hand allowing the tension to be adjusted by rotating the frame. This permits both the stainless steel Terminals to be screwed in or out simultaneously without twisting the attached stainless steel wire rope or fittings. Miami Stainless range of Turnbuckles include Econ and the ultra high quality ProRig brand. *It is the Purchasers’ responsibility to determine whether the testing procedure and breaking load is suitable for purpose.